New for October 2017! 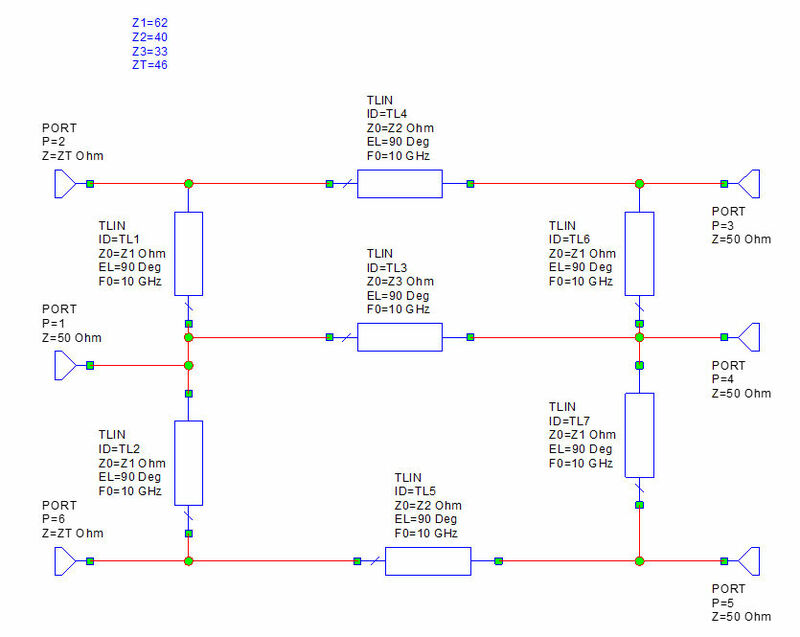 This circuit is in a rare class of true planar, three-way power dividers. Compare it to our "planar" three-way Wilkinson. which is at best a compromise as that Wilkinson does not offer the theoretical possibility of perfect isolation. The three-way branchline is an obvious network, once you see it! 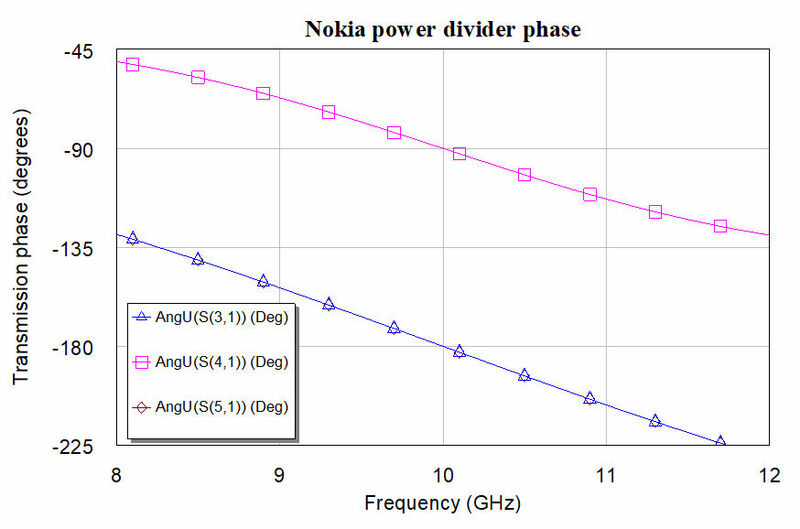 It provides two signals in quadrature, and one in phase. This circuit was patented in 1992, by Nokia. The inventor is Gerry Allen Parker. We're not lawyers, but we think the patent protection is about to expire. Even if it was enforced, there are always improvements that could be applied to em-better it and possibly spin out a new invention. Below is a link to the patent that we downloaded. Below is a schematic. It is basically what is left when you paste two branchline couplers on top of each other, and then mess with the arm impedances. It is convenient: the three output ports are located on the same side. Funny, the way it is shown is asymmetric, the terminating impedance are on the left side and are set to 46 ohms after we let the optimizer rip on it. The patent shows them at 30 ohms. 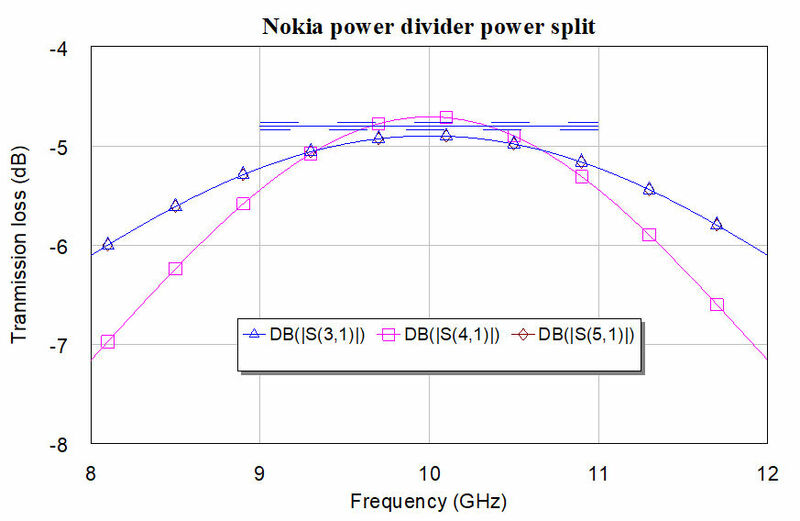 Below is the power split, after we tried to optimize it to "perfect" -4.8 dB. 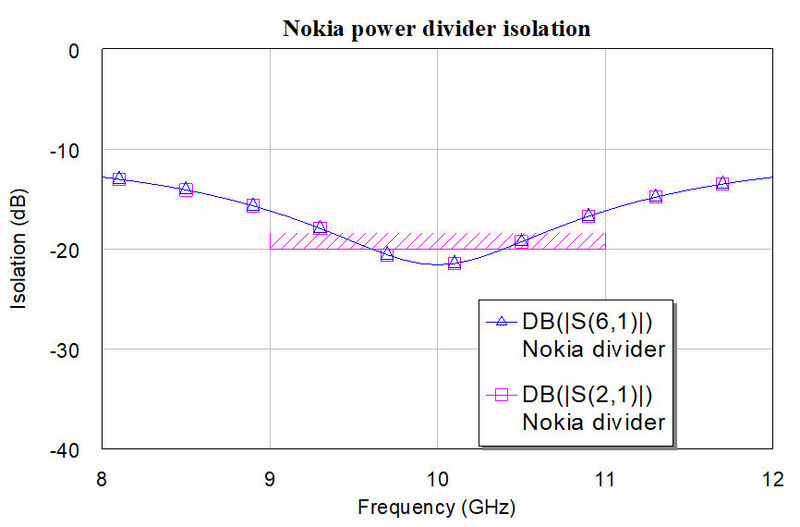 Ports 3 and 5 have the same amplitude because of symmetry. It is kind of narrow band. 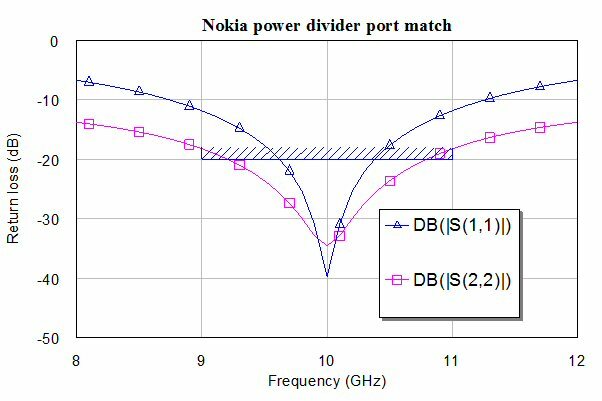 The port match also shows narrow-band response, but you can imagine that perfect match is theoretically possible at the center frequency. The phases of the output arms are shown below. The outer ports lag the center port by 90 degrees; Captain Obvious wishes to point out that RF energy has to travel an additional 90 degrees to reach ports 3 and 5 cmpared to port 4. This is a a true quadrature combiner.